Handmade rose gold plated silver round target eye pendant whith black and white enamel on rose gold plated silver thin chain. LENGTH 40 cm + 4cm silver chain extension. 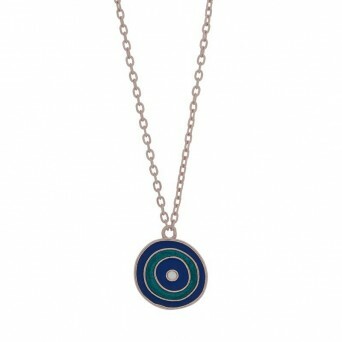 Handmade sterling silver target eye pendant whith blue and white enamel on silver thin chain. - P.. Handmade rose gold plated sterling silver eyedrop earrings with white, blue and black enamel. - ..